Information on printer problems and printers. The printer, if you own a computer, you use a printer. Most printers now days are USB and are very easy to setup. All you do is install your software first, depending on the printer you buy, then plug it into a USB port and away you go. They can copy, scan, fax and even print lol. The biggest cost of a printer now days is the ink cartridges, one person I know just buys another printer instead of new cartridges for the one they own. Why? You sometimes pay less for a new printer with cartridges included, then what you would pay for just the ink cartridges. That is only with the really cheap printers, but that is one thing to consider when buying a new printer, what are the replacement ink cartridges going to cost. Printer manufactures are selling the printers cheap and making the money on the consumables, the ink cartridges. The one nice thing about the printer being USB compatible, is if you are like me and have 2 or 3 computers, you just install the printer software onto each computer and like me I have it setup on my wifes computer, I just unplug it from hers and plug it into one of the USB ports in the front of my computer and print away. We own an HP printer and they allow you to install the software onto multiple computers, some may not so you should check before you do that. The only problems I have had with the printer, besides running out of ink at the wrong time lol, is sometimes it will go offline and then will not print. 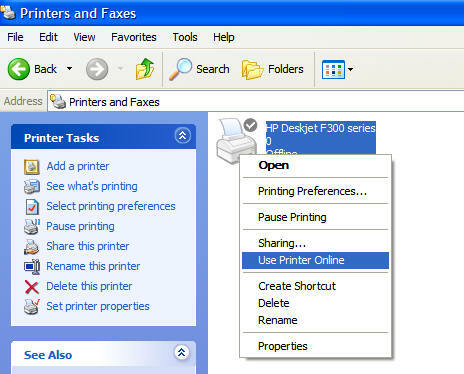 So if for some reason you cannot print, go to the Control Panel and open the Printers and Faxes Icon make sure it say's online [picture below], mine is offline because the printer is not connected to my computer at the moment, if it shows offline, right click on the icon and choose [Use Printer Online] the printer should work again. 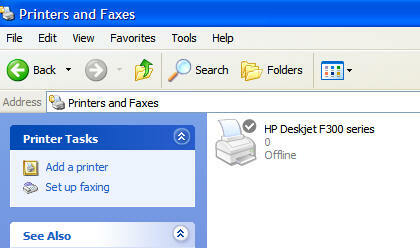 This shows the Printer Offline. This shows what to choose to make it Online. I have bought a couple of those cheap printers, cost around $20.00, if all you need it for is to print, they work ok, but the ink cartridges do cost more then the printer. The problems with those are, that you have no scanner, no copier, just a plain old printer, I also had problems with one, the ink cartridge for the color stop working after printing just a couple pages, after a search on Google, I found that a lot of people were experiencing the same problem and if you keep buy a new cheap printer, hmmm, you gotta growing disposal problem. So I bought a mid range printer and made sure the replacement costs of the ink cartridges was the lowest of the group, it has run trouble free and I have the Scanner, Copier and a very good Printer.